Authors: David Kuridze and M. Mathioudakis from Astrophysics Research Center at Queen’s University Belfast. R.J. Morton and R. Erdélyi from Solar Physics and Space Plasma Research Centre (SP2RC) at University of Sheffield. The chromosphere is the highly dynamic region of the solar atmosphere between the photosphere and corona. It is dominated by fine-scale, jet-like structures, such as limb spicules, on-disc mottles and active region fibrils. These plasma jets, guided by the local magnetic field, can protrude into the corona and act as conduits for channeling magnetohydrodynamic (MHD) wave energy generated below the solar surface to the upper parts of the solar atmosphere. They are thought to play an important role in the energy balance of the upper solar atmosphere, so the study of MHD oscillations in these plasma jet structures is critical for understanding the energy transport. This nugget describes observations of transverse oscillations of chromospheric plasma jets known as mottles, which are located at supergranular cell boundaries and ejected from the lower chromosphere . Mottles have typical lengths of 4-6 Mm and lifetimes of 2-10 minutes. They are often considered as the disk representation of chromospheric spicules, as they have similar temperatures, density profiles, widths, lengths, and life-times. The observations were obtained at the solar disc centre on 29th September 2010, with the Rapid Oscillations in the Solar Atmosphere (ROSA) imaging system located at the Dunn Solar Telescope, New Mexico. 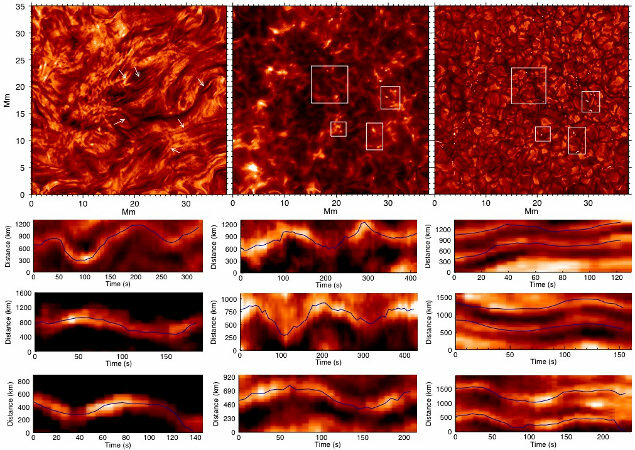 The high temporal (~7.7 s) and spatial (~150 km) resolution of our Hα data shows chromospheric mottles and their transverse motions in unprecedented detail. The total duration of the observation was about hour. The field of view covers 34 Mm×34~Mm of a quiet Sun region and contains the edge of supergranule cell. Figure 1: Top row: images of the upper chromosphere (Hydrogen α core), the lower chromosphere (Calcium II K) and photosphere (G-band). The arrows in the Hα image indicate typical bright and dark mottles. The brighter regions in the lower chromosphere mark the supergranule boundaries. The bright points in Ca II K are intense magnetic features that correspond to magnetic fields reaching into the corona. The bright points in Ca II K are co-spatial with bright points in the G-band images. The G-band images show that bright points are located in the dark inter-granular lanes. Lower panels: typical Hα time-distance diagrams of the mottles, which show their transverse motions. The Hα images are dominated by elongated, very dynamic, dark and bright mottles (Figure 1), which appear co-spatial with Ca II K brightenings and photospheric G-band magnetic bright points. Movies of the region reveal that the mottles are subject to a continuous swaying motion and that the motion is ubiquitous throughout the observed region. Movies also show that the bright points are jostled by the convective motions of the granulation. So we think that the transverse motions are generated by the convective motions of granules shaking the magnetic field lines. 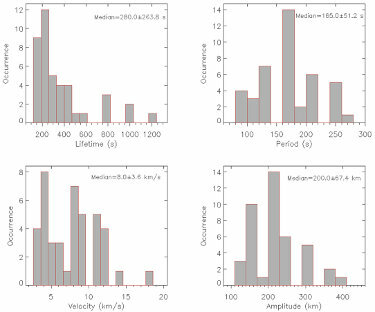 Figure 2: The histograms show the typical properties measured for the transverse waves; lifetime (top left), period (top right), transverse velocity amplitude (bottom left), and transverse displacement amplitude (bottom right), for the 42 mottles analysed in this study. Median values with standard deviations are also given. In 12 cases, the transverse waves show evidence for damping. The damping properties were investigated by fitting the intensity profiles with an exponentially decaying cosine function, as shown in Figure 3. Mottles are cool, dense material in the vicinity of strong magnetic flux concentration in network regions co-spatial with photospheric magnetic bright points. They can be approximately modelled as cylindrical magnetic flux tubes supporting a low-β plasma (i.e., gas pressure << magnetic pressure) embedded in a field-free (non-magnetic) or weak-field (compared to the mottle’s magnetic field) environment. Our observation of clear transverse displacement of the mottle axis suggests that the most appropriate interpretation for the oscillations is that of propagating or standing kink waves. The measured radius of the mottles (~200 km) and the estimated wavelength of the transverse motions (~4800 km) shows that the observed waves lie in a regime known as the thin-tube limit. This implies the observed waves are highly incompressible and hence difficult to damp. Comparison of the damping times and periods of the observed kink waves and the best-fit power-law scaling indicates an almost linear dependence between them. (Figure 3). Resonant mode conversion predicts that the damping time is a linear function of the period and may therefore be responsible for the damping of the oscillations in the chromosphere . Phase mixing is also a plausible interpretation of the observed damping . Figure 3: The left hand images show the measured mottle displacements (black line) fitted with an exponentially damped cosine function (red line). The right hand plot shows calculated damping times, τ , vs period, T, obtained from the fits to the transverse displacement (red diamonds). The solid line is the best fit scaling law. The dashed and dotted lines are the expected scaling laws for resonant absorption and phase mixing respectively. Assessing the rate of damping of the waves is vital for calculating their contribution to the heating of the solar atmosphere. Our studies of 42 mottle transverse oscillation events (Figure 2) show that the mean period, amplitude, velocity amplitude, lifetime and phase speed of the observed mottle oscillations are similar to those of limb spicules [4, 5]. The transverse oscillations of the mottle’s axis can be interpreted as fast kink MHD waves of an over-dense magnetic waveguide. The relation between the kink wave damping times and periods suggests that resonant mode conversion and phase mixing are viable damping mechanisms (Figure 2). The chromosphere appears to be a reservoir of transverse waves whose energy  could contribute to the heating of the corona or acceleration of the solar wind (two longstanding problems in astrophysics), and further studies will determine the details of the wave propagation between different layers of the solar atmosphere. The observations of transverse motions in mottles/spicules also opens up an exciting avenue for magneto-seismology of the chromosphere . Plasma parameters (e.g., magnetic field, density, etc.) are difficult to measure directly, but with magneto-seismology we exploit the observed wave properties (e.g., phase speed, amplitude) to obtain estimates for the plasma parameters – an approach that has been successfully applied to the solar corona.